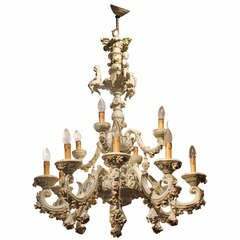 Sparkling and shiny this Louis XVI style six arms chandelier manufactured in Florence in early 19th century is the attractive eye-catching lighting pendant. The gilt casted iron basket frame has a pear-shaped structure completely adorned with hundreds of original and antique glass beads and cut crystal facetted drops, glass flowers, rosettes and prisms. The six scrolled gold iron branches, each holding candle lights formed as buds with round trimmed flower-shaped glass drip pans tray, have candelabra bulbs raised on semi circular molded giltwood bobeches. The trellis pattern's beads are hung throughout the open gilded bronze birdcage body and form a wavy interlaced pattern along the arms while the crystal drops form a crown shaped effect on top with plenty of light. 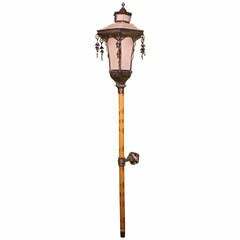 A giltwood stem on top with a glass canopy to hang the chandelier on the ceiling and a molded carved giltwood stem inside enriched with cut crystal pendants complete this gorgeous lamp. The cut crystal ball underneath the chandelier provides a touch of elegance and sophistication. This neoclassical period ceiling lamp is in incredible good condition, no glass and crystal parts missing and absolutely no cracks or chipping. This fabulous six lights fixture pendant is of the finest quality, thanks to its elegant proportions and shape is suitable for any room of your home, will work well with any setting from the most Classic furnishing to the Modern period ones. It's ready to fill any room of your home with a sparkling, warm and welcoming glow. Not recent wiring but tested and fully functional electrification, ready to use. Measures: Please find out a special Flat rate shipping quote including professional packaging, wooden crate, insurance and door to door consignment. An exquisite oval oil on glass feat. 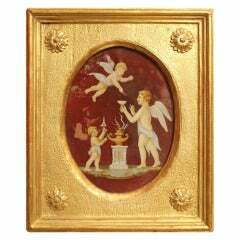 Neoclassical scene in the Pompeian Taste in giltwood frame. Shipping complimentary. 19th century neoclassical gilt-iron chandelier with six arms and crystal prism and pressed glass decoration. Newly wired for use within the USA with UL listed parts.